One thought ahead. Two sentences behind. I have to say as a Minnesotan I am sometimes jealous when it comes to the accomplishments of the Lone Star State. They stole our hockey team and will always have more Super Bowl rings. Just from a literary standpoint, two of my favorite authors hail from Texas, Cormac McCarthy and Larry McMurtry. Lately, I’ve been trying to compensate for this imbalance by keeping my novel selections local. That’s why I read Leif Enger and for the first time picked up a novel by Louise Erdrich. Although widely known and universally praised, I usually steered from Erdrich’s prose for I was told her style was dense and unflinching like a knotted hardwood tree that if felled would land hard on the reader. 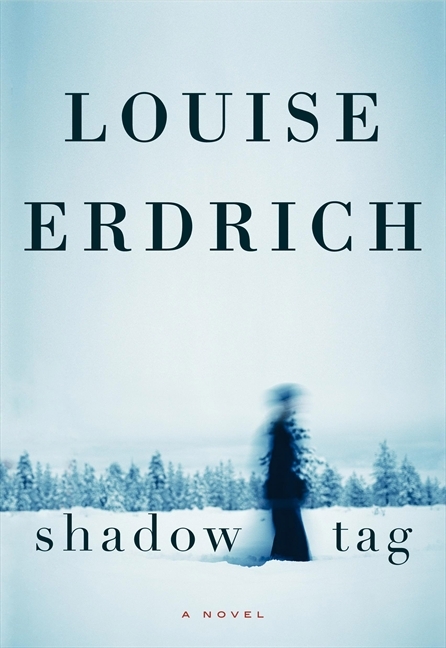 But although bleak, I found no oppressive weight in her latest novel, Shadow Tag. The reason I chose the novel is because of an interview Erdrich had with TV journalist Bill Moyers. She was there to promote her new book, but Moyers’, who hails from the Lone Star State, could not help bestow levels of grandeur that Erdrich tried to fend off like moths on a warm summer night. MOYERS: A well-known reviewer said that with each successive novel, Louise Erdrich is writing, she’s writing more like Ernest Hemingway, William Faulkner, Albert Camus. That’s a heavy burden. ERDRICH: If I thought that way, I wouldn’t be able to do a thing. MOYERS: Still, those are some mighty big shoes to fill. ERDRICH: Bill, I don’t want to wear men’s clothing. MOYERS: Even Faulkner’s. I would slip on his shoes, unless they were too small. Do you know, was he a tiny man? ERDRICH: I really don’t know. MOYERS: Still, what a literary giant. MOYERS: And here we sit with the past and the present, Faulkner and Erdrich. ERDRICH: Now we are a law firm? Eventually, the interview moved to Erdrich’s new book, a story about Gil and Irene, a married couple who are both of European and Native American descent. Their marriage is a disaster and could be seen as a microcosm of race relations between the original Americans and early settlers for it’s about possession, freedom and space to find your own identity when none is granted. One thing the settlers and the Native Americans both had in the new world was space. The problem was nobody wanted to be accommodating. The Comanche and Sioux were warriors who had no problem running roughshod over weaker tribes. And once they established their dominance, it was only a matter of time before new immigrants with the Great White Father would move in and do the same. Gil and Irene continue this battle in the comfortable surroundings of modern day Minneapolis. Gil is a successful painter who has made a name for himself by creating popular portraits of his wife. And the only way he can capture Irene on canvas is to know every bit about her, inhabit her, make his presence so thorough there would be moments where she would question her own existence. So, she keeps a diary. And when she finds out her husband is reading it, she starts keeping two. One to keep Gil guessing and the other to figure out what it all means. I grew up in South Dakota and I saw the end result of one race trying to imprint their will on another. Alcoholism. Unemployment. Homelessness. On Saturday mornings on my way to work at the downtown public library I would sometimes see members of the Sioux nation sleeping on what green piece of land they could find. At the time I saw them as shiftless and lazy. I wish I would have known better.